Note that our own Craig Shaw Gardner will be participating in the noon panel! Registration is required for the workshops, as the number of participants is limited. *Please call 978-897-1010 x103 to register. **Call 978-897-1010 x106 to register. IF YOU HAVE A COMICKY EVENT YOU’D LIKE TO HAVE LISTED HERE, DROP US A LINE! Just contact us! 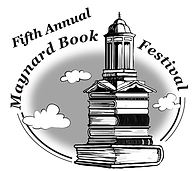 This entry was posted in Events and tagged Convention, Craig Shaw Gardner, Maynard Book Festival by Roho. Bookmark the permalink.